Hey everyone! I'm preparing for some family to come visit this weekend so I didn't have a time to write a huge long post. Instead you get a little writing funny. Enjoy! The first one is what would happen if Grandma's family were zombies! @Kateri Von Steal Oh my gosh that is hilarious!! lol, it's amazing what a mere comma can do. LOL! I saw this on a blog yesterday and saved it for a post! Haha. You totally beat me to it. This is hilarious tho. Have a great weekend! And who said grammar wasn't important? Have a great weekend! I am horrible with puncuation,so Grandma would probably die. LOL. This would be a great poster for a grammar class! I love this!!! Thanks for sharing. That is funny! Commas are one of my worst pitfalls. ha ha. 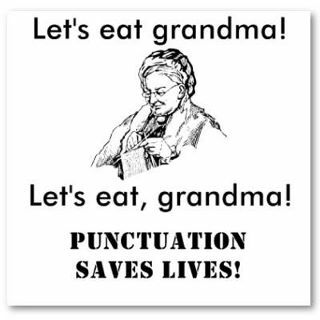 Let's eat Grandma. That's hilarious. Thanks for sharing. Haha oh I love this! That's a good one. :D I'll never forget the comma again. Bahahaha! I am interested in your stance on the serial comma? I am pro- but my agent is against. Sigh. @Christa Oh, I'm all for the serial comma. Did you see the thing on @E.R. King 's blog the other day? Totally explains why the serial comma rules! ROFL! That is awesome. And . . . perfect! Hope you enjoyed the family time! I love this!! Yay for writers. Love the blog!